Advanced Web Ranking (AWR) is one of my favorite pieces of SEO software on the market today. It has been indispensable to me over the years. The software does it all and then some. I reviewed it a few years ago; you can read that here, most of it is still relevant and I'll be updating it in the near future. 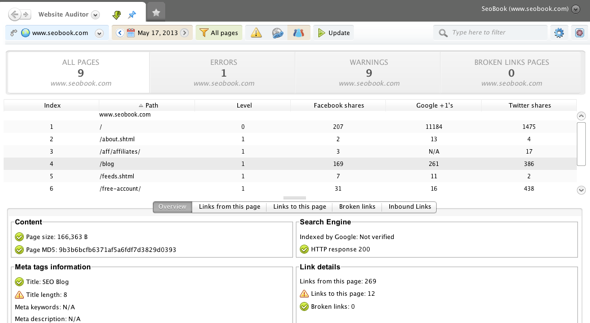 In this post I want to highlight their Website Auditor tool. 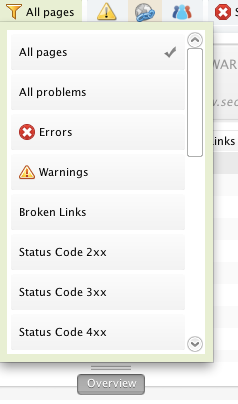 The beauty of this feature is the simple integration of on and off-page elements. There are other tools on the market that focus solely on the on-page stuff (and do a fantastic job of it) and AWR does as well. 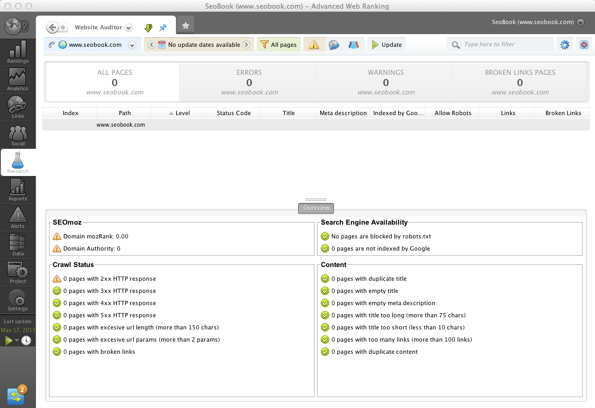 The all-in-one nature of Advanced Web Ranking allows you to deftly move between the on and off (links, social, etc) page factors for a site (and its competition) inside of the Website Auditor feature. AWR has other tools built-in to go even deeper on competitive analysis as well. 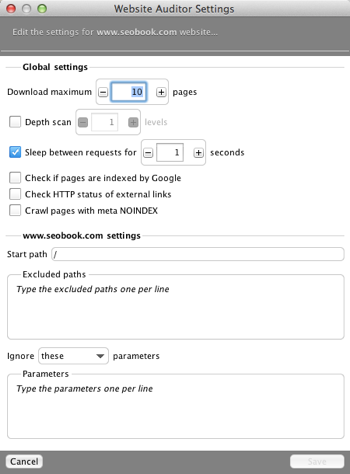 You can also set the tool to crawl only certain sections of a site as well as completely ignore certain sections or parameters so you can make the best use of your 10,000 page-crawl limit. This is a nice way to crawl a specific section of a site to find the most "social" content (limit the crawl to /blog as an example). The other 2 views are more of a mix of on-page and off-page factors. In this view you can click on any of the crawled pages and see links to the page internally and externally as well as broken links. This data is helpful in finding content ideas, competitor's content/social strategy, and for finding possible influencers to target in a link building/social awareness campaign for your site. You can also do a quick export from the viewport window inside the Website Auditor tab to get either an HTML/PDF/CSV export of the data you are looking at (list of link issues, social stats, on-page issues, and so on). Reports can be scheduled to run automatically so long as the computer AWR resides on is on and functional. You could also remote in with a service like LogMeIn to run an update remotely or use the AWR server plan where you host the AWR application on one machine and remote client machines (staff as an example) can connect to the shared database and make an update or run a report if needed. Advanced Web Ranking's Website Auditor is one of the most robust audit tools on the market and soon it will have integration with Majestic SEO (currently it ties into OpenSiteExplorer/Linkscape). It already pulls in social metrics from Twitter, Facebook, and G+ to give you a more comprehensive view of your site and your content. Is this a sponsored post? The product looks decent, but would like an unbiased opinion. this post was not paid for in any way by AWR. I pay our employees to contribute, but we were not paid for the review. We may at some point add affiliate links to some reviews, but this one wasn't even any sort of an affiliate review either. I purchased a licence some time back but this software stopped working for me this month. I contacted the support team and I was informed "Google did some changes and we were forced to make the same change in our application with a search engine update, to get the results from them again"
In order to get the software functioning I was asked to but a maintenance plan for 89e (euro) for 12 months! The software wont work without the plan so I cant understand what the couple hundreds of euro buying the licence was for. Having to also play 89e p.a. seems like extortion. Thanks for the review Aaron. 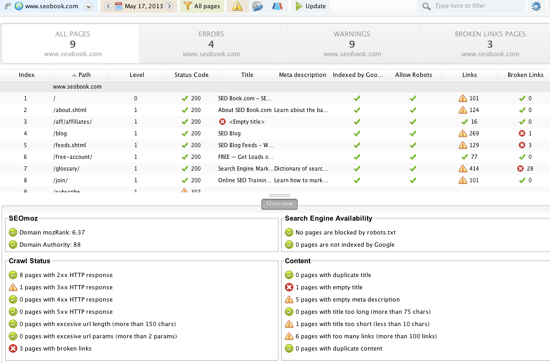 Looks like good among other SEO software. Downloding 30 days trial version.